Event fields are fields on the event editor where you can include various types of information for the events on your Teamup calendar. On the right side, you can see an event editor with customized event fields. 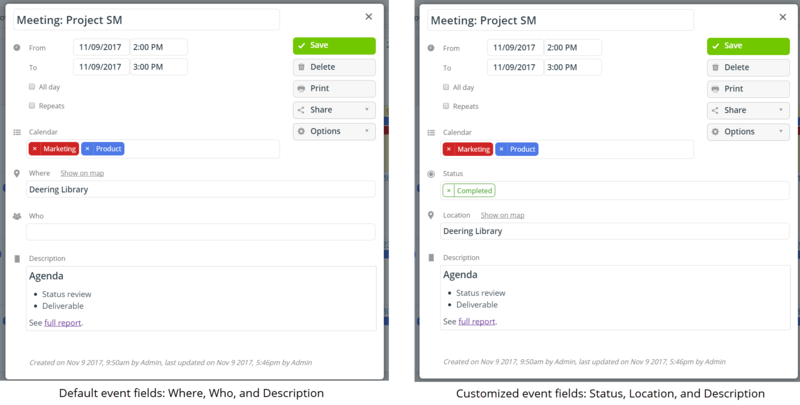 With Teamup, you can create customized event fields, and choose the order in which they appear on the event editor. You can also modify the default event fields. You can rename the field, deactivate it, or make it required. To modify default event fields, or to create a new, customized event field, go to Settings > Event Fields.